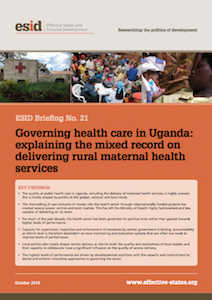 Maternal and child health conditions account for over 20 percent of the total disease burden in Uganda. The persistent poor maternal health outcomes stem from poor quality provision and low utilisation of health services at all stages. Despite having a roadmap for accelerating reduction in maternal morbidity and mortality, there are many bottlenecks in the system, and after nearly five years of implementing the plan the successes have been modest. The imperative of maintaining power seems to have distracted politicians at national and local levels from building a more effective health service that can deliver high-quality provision. Our research traces the sector’s changing politics, focusing first on the national level and then on a comparative case study of government performance in Sembabule and Lyantonde districts.